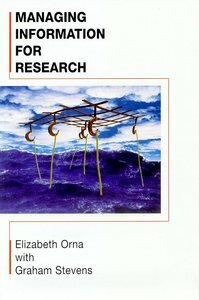 This is a book for first-time researchers which addresses the problems and anxieties they themselves define as most important, such as* transforming the knowledge gained during research into written form; managing time; organizing the information they collect and create; transforming information from written sources into usable knowledge; and coping with feelings of isolation and loss of confidence. About "Managing Information For Research"
What Are We Doing When We Do Research? Design Is More Than Cosmetic! The Process Of Converting Information Into Writing - Making It Easier.